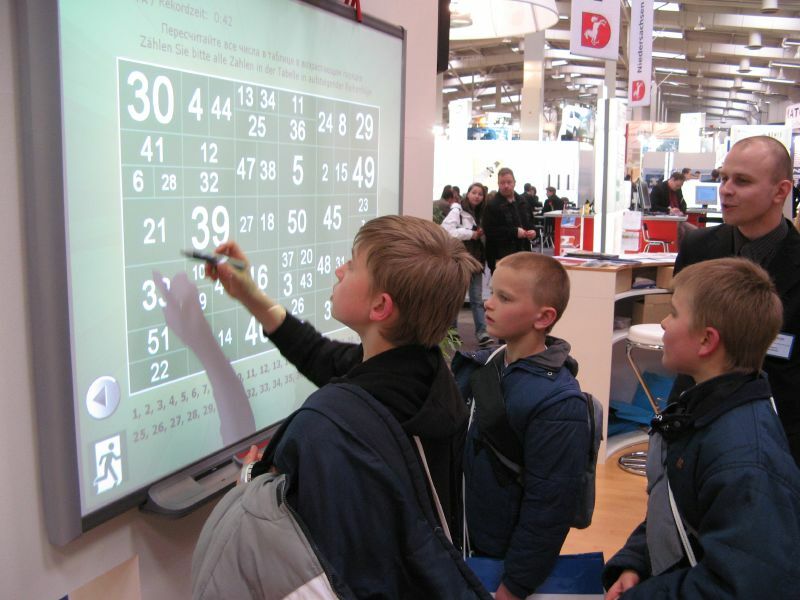 Interactive Whiteboards – Fix or Fad? When such an education luminary as Robert J. Marzano starts singing the praises of interactive whiteboards (IWB), people listen. And sales go up. In an ASCD article, Dr. Marzano writes about huge gains, 16 points, in student achievement when the magic boards are used in classrooms. Are these boards really the magic fix for our classrooms that we’ve all been so desparate to find? Or, are they just another classroom fad? If the latter, then they’re certainly an expensive one that costs thousands of dollars per classroom. We should ask two penetrating questions. Is there another less expensive way to match interactive whiteboards? Do they, uniquely, really produce the gains Dr. Marzano reports? Answering the first question poses no real challenge. Nearly every classroom already has a projector screen. Many have VGA (or better) projectors installed or available. These projectors that display a computer’s screen are readily available at much lower costs than the IWBs. The IWBs, after all, just display a computer screen. The computer is required in both cases. For a modest cost, classrooms can have the display capabilities of IWBs. What about the interactive part? IWBs allow teachers to work directly with the projector screen. They can use a special stylus or their fingers to perform the same actions that a mouse does right on the board. In so doing, they must turn, at least partly, away from the students. A computer properly set up allows the same teachers to face the class while manipulating the information on the screen. It could even be a touch screen but wouldn’t have to be. The IWB has no advantage here. Readily available software will allow teachers to perform the same actions of drawing colored lines that the IWB does along with all of its other capabilities. Generally speaking, the IWB holds no advantage over a much less expensive projector and screen. What about the advantages of having the teacher standing at the board gesticulating and interacting directly with the board? I can imagine that some teachers with really good showmanship skills could glean some benefits from this technique. They themselves might enjoy preforming in this manner. However, I believe that the students will benefit very little and, in the cases of less capable performers, not at all. The second question requires looking at what Dr. Marzano reports. He claims that three features “inherent in interactive whiteboards” improve student achievement. Use of graphics and other visuals to represent information. Interactive whiteboard reinforcers such as visual applause for the correct answer. Of these three “inherent” features, the second two can readily be added to the simple projector and screen system that costs a small fraction of what an IWB costs. They are inherent only in computer-based projection systems, not in expensive IWBs. They require the same amount of teacher preparation in either case and should have the same pedagogical results. Voting devices in the hands of each student cost extra no matter which system you use. They can be purchased without buying an IWB. So far, results strongly suggest that the appropriate use of voting devices in classrooms truly does improve average student achievement. The student responses are anonymous, and the aggregated responses appear as a bar graph for all to see and discuss. Every student participates. In my opinion, all the benefits that Dr. Marzano presents can be achieved without using an interactive whiteboard. Dr. Marzano goes on to explain the common errors made with IWB technology and also to explain that teachers must organize their content carefully if they wish to make the best use of the technology. He makes the important point that technology will not fix anything by itself but requires training and work. Otherwise, results can be worse with the technology than without. The popularity of IWBs has forced educators to rethink the way courses are taught, and for that, we can be appreciative of their invention. New ideas that have come from classrooms using the technology have been trumpeted across the education marketplace by the manufacturers of IWBs because of the profits that they will gain from increased sales. In my opinion, all the benefits that Dr. Marzano presents can be achieved without using an interactive whiteboard. Less expensive alternatives exist. The boards use up valuable classroom space and have a very high cost. If you gave each of the teachers in a school the money that might be spent buying (and maintaining) an IWB, would they spend it on one, or would they find better uses for the money? More to the point, if you gave them the alternatives of an IWB system or a projector along with the difference in cost to spend on other classroom material, which would they be most likely to choose? In these days of declining school budgets, let’s spend our education dollars wisely.